Bishop Verot Catholic High School is proud to partner with SAGE Dining Services, one of the premier providers of dining services and gourmet catering to private schools, colleges, and corporations in the Eastern United States. SAGE provides talented managers, chefs, well-trained staff members, and a creative menu to transform Verot's on-site food service into a memorable dining experience. Bishop Verot's cafeteria is debit only, no-cash system of payment. The debit system: 1) has proven more cost effective for parents, 2) allows parents to more readily track their child’s spending, and 3) reduces waiting in lines for the students during their lunch periods. *For new students, the ID# will be given out at Freshman or Transfer/International Student Orientation. If you would like to set up the account prior to this date, please email Mr. Ben at a.ben@sagedining.com for your student's ID#. Please click here for a Welcome letter Sage Dining for the 2018 - 2019 school year. Plan ahead, see our Lunch Menu for the month! 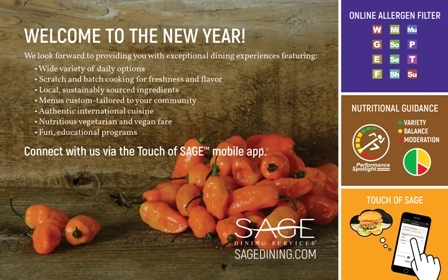 The lunch menu and other dining informaiton may also be found on the SAge dining app. Please click here for more information. Please click here for Sage Dining recipes.